As Thanksgiving is upon us, a few issues will likely preoccupy many Americans. Many of us will be unhappy with the quality of the cooking, and our dinner guests will annoy us. On Thursday, some people will be saddened by the result of a football game. 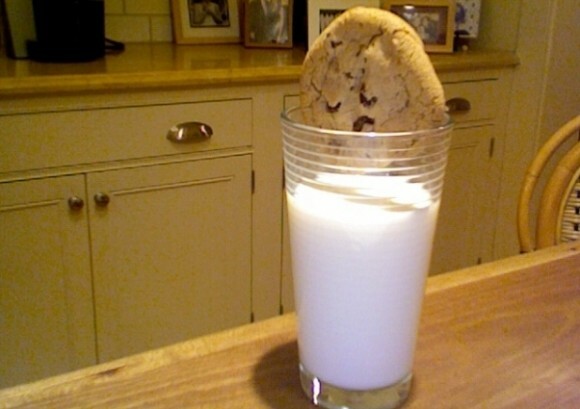 I like to classify these issues as “First World problems.” When I get annoyed because I haven’t eaten lunch by 3pm, or I get some grease on my pants from leaning on a dirty screw machine, or maybe I’m just having trouble dunking a cookie in my glass of milk (see photo), I smile and tell myself, “These are ‘First World problems,'” and I feel better. Seriously, if you ask people who know me, they will tell you that I spout this line all the time. Sure, people do have real, tough problems living in this First World nation of the USA, in my opinion one of the best countries in the world to live in. But sometimes, we need to just remind ourselves to take a step back for some perspective. I’m not going hungry, I don’t live in a war zone, I’m healthy (as far as I know), I live in a decent home, my government — although far from perfect — gives me freedom (maybe not as much as I’d like), and I don’t have Ebola. Perhaps my life is pretty simple and easy compared to that of most people. But I believe it’s mostly up to you whether you want to feel thankful for what you have in this world or focus on problems, many of which are trivial. One First World problem some of us will be encountering Thursday will be the social awkwardness that sometimes comes with spending time with “friends” and relatives. Personally, I love my family and feel very comfortable spending time with them, but I know not everyone has that luxury, and starting and sustaining a conversation can be a painful struggle for anybody. I recently bought a book on a whim that has been useful in navigating some awkward social challenges. It’s a book about small talk, called What to Talk About. The book is hilariously written and gives practical suggestions for making conversation at family get-togethers, at work, or on a date. One of the main principles the book encourages is to make your conversation partner tell stories. For instance, rather than ask someone, “How was your day?” the book suggests to ask, “What did you do today?” Or, instead of asking someone, “What do you do?” ask them, “What’s your story?” If someone starts talking about how the weather that day is cold, instead of responding with, “Yeah, it sure is cold,” you ask them about the craziest coldest day they have ever experienced. I love this book. It’s brilliant. It even has a wonderful section about what to say on a date if you fart by accident. It’s my sincerest hope that all of you have a fun, relaxing, socially un-awkward holiday. I hope you are able to appreciate the great gift it is to live in America, despite its flaws. People all over the world would kill to switch places with us. Caffeine-free vs. Glutten-free for the rest of your life? Happy Thanksgiving everyone. I am thankful for American manufacturing. Great Article. It is so true that if we really looked at our problems compared to other people’s problems – our problems would simply disappear. Be thankful for your blessings no matter how small because you could always have it so much worse. First World problem. I’m never sure that my opinions are worthy to leave as a reply. I value your opinion, Bob. 3. Can’t give up either! Thankful that this is still the greatest country on God’s earth, and I am reminded of this often by the Polish and Mexican guys here at work. 1. After a bad series that included a 139 game my bowling average dropped 5 pins. 2. Pie (Now I’m hungry for pie). 3. Hmmm. That’s a tough one, another first world problem. My brother, a Microsoft-ie, often replies to my complaints with “First World Problem!”. Mine are usually technology related, so it does apply. Cake vs. Pie? – Both! Caffiene vs. Gluten? I can’t imagine going without either, but probably gluten. When my children were young we were visiting Puerto Rico and they had been been getting a little “big for their britches” so we drove through one of the really poor barios where people were literally living in cardboard boxes. That changed their whole perspective on life. And they never complained about not having something and actually. Appreciated what they have. It was a hard lesson but it made them (and me) better people. Lloyd does not blog often enough to satiate my appetite for the most nourishing sustenance on the planet… Knowledge. You didn’t realize that Lloyd did not write this blog. It was little old Noah. First World problem, I guess. Noah, I love this blog. My First World problem is bad knees and knee replacement surgery next week. I will continue to write between the Vicodins. Happy Thanksgiving. God Bless Anerica. In my later years I have become a voracious reader. I have two favorite authors and several next in line. A hell of a 1st World problem is when none of the five or six have a new novel. I am forced to pick up something serious like Socrates or Plato or Homer. Like I said……a hell of a problem. Guess that gives me some serious thanking to do at the dinner table tomorrow. In fact 1st World problems will be the dinner table topic of conversation. If all the troubles in the world were all piled in one common heap, most people would probably be glad to take back there own and depart. Post Vought Aircraft: Met two of my laid off buds, and they both found jobs with less pay but people they can relate to. I survived the cuts and transferred to new plant. Let my laid off buds know I’m in or close to the same boat they are in, which seemed to give them peace of mind. Lacking a crystal ball, I’m Thankful for the here and now. We still have water, food, and metal to cut. I choose Pie, just about any Pie! Gluten free, Caffeine keeps the machinist working.